One of the keys to [UKIP’s success in bringing about the 2016 referendum] was talking about things that everyone else wanted to brush under the carpet. Issues like immigration, which we were told that if you talked about that, it was somehow disreputable. I made sure that UKIP talked about tough issues, but we absolutely excluded anybody who’d ever been a member of the British National Party, the English Defence League, we wanted to make sure that when the abuse was thrown at us it couldn’t possibly be proved to be true. I’m afraid that over the course of the last few months under this leader, Mr Gerrard Batten, a lot has changed. He seems to be pretty obsessed with Islam, not just Islamic extremism, but Islam. UKIP wasn’t founded to be a party on fighting a religious crusade… [Robinson] brings with him a group of people among which we see scuffles, violence, many have criminal records — some pretty serious. All of this drags UKIP away from being an electoral party, to a party of street activism. I wrote ten days ago that this direction was catastrophic, especially at a time the great Brexit betrayal is upon us. This Sunday there is going to be a march in London with Gerard Batten and Tommy Robinson as the speakers, two days before the most important parliamentary vote in modern times. The image that will give of what Brexit stands for is something our enemies will use against us for many years to come. Damaging Brexit is one thing, but damaging the Brexit cause is even worse. I, with a very heavy heart… simply can’t go on with it. I simply don’t recognise the party I founded and fought for all those years, it has been so tarnished… as of now, I have resigned my membership of UKIP. Breitbart London has approached Mr Farage for further comment. 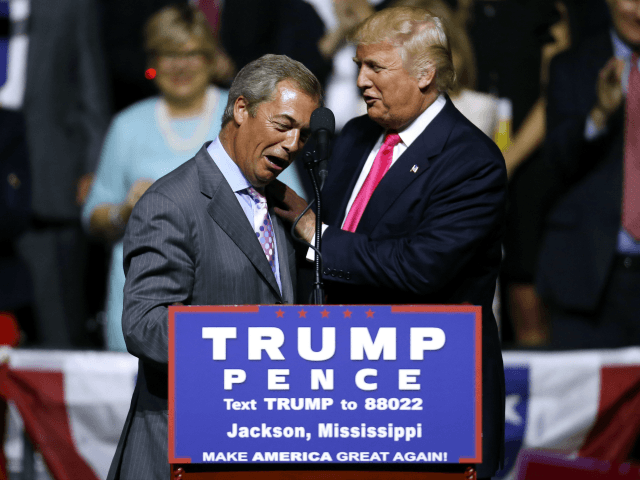 Despite having not been leader of UKIP since 2016, Mr Farage has seen rising involvement in the continuing Brexit debate in recent months, heading the Leave Means Leave campaign and touring the country, giving speeches. Calling Theresa May’s Brexit the “worst deal in history“, Mr Farage told Breitbart London that the deal was akin to voluntarily going to prison and then trusting the jailer to let you out when you asked to go and that the Prime Minister would use “every blackmail trick known to man” to push it through.